Setiap pendaftaran sekolah pada umumnya dimulai dengan banyak pertanyaan. Dibawah ini adalah pertanyaan yang sering diajukan oleh orang tua/wali calon pendaftar yang telah kami rangkum. Bila orang tua/wali memiliki pertanyaan yang sama, silahkan mengirim daftar pertanyaan berikut melalui email : depokmontessori@gmail.com atau menghubungi kami di no telp: 021 77885753 / sms : 0818685772. Staf kami akan menjawab pertanyaan yang diajukan. Apakah metode Montessori adalah sistim pengajaran untuk anak – anak usia dini ? Montessori classroom berbeda dengan kelas tradisional biasa? Dimana meja belajar anak, dimana guru berdiri ? Apakah materi sekolah Montessori lebih susah dari kelas traditional ? Tanpa ukuran tingkatan yang jelas, bagaimana mengukur performance assessment siswa ? Apakah benar , di sekolah Montessori tidak ada homework dan text book? Kelas Montessori adalah kelas tanpa saingan, bagaimana anak akan menghadapi persaingan hidup yang sesungguhnya? Apakah perbedaan sekolah traditisional konvensional dan sekolah Montessori? Apakah Depok Montessori school sekolah Islam ? Apakah sebagai orang tua , saya dapat berpartisipasi untuk sekolah anak saya? Program bahasa apa saja yang diajarkan di Depok Montessori School ? Ekskul apa sajayang diajarkan di Depok Montessori School ? Meneruskan kemana saja alumni Depok Montessori School? Apakah lulusan Depok Montessori School bisa beradaptasi ketika ingin melanjutkan ke kelas traditional konvensional biasa ? Setiap pendaftaran biasanya dimulai dengan banyak pertanyaan. Dibawah ini adalah pertanyaan yang sering diajukan bagi calon pendaftar. Bila orang tua/wali memiliki pertanyaan yang sama, silahkan mengirim daftar pertanyaan berikut melalui email : depokmontessori@gmail.com atau menghubungi kami di no telp: 021 77885753 / sms : 0818685772. Staf kami akan menjawab pertanyaan yang diajukan. Apakah masih ada tempat untuk anak saya ? Apakah ada waiting list ? sampai berapa lama ? Apakah saya dapat mengunjungi / melihat? Berapa siswa di kelas ? Berapa murid baru yang akan diterima ? Program apa saja yang akan diikuti anak saya dalam setahun ? Apakah ada program untuk kindergarten? Bisa anak saya masuk 3 kali seminggu? Apakah program harian untuk anak saya? Usia berapa anak bisa bergabung di Depok Montessori School? Apakah program Montessori bagus untuk semua tipe anak? Apakah biaya yang saya bayarkan sudah termasuk biaya makan? FAQ about Infant, Toddler, Preschool, PreK, Kindergarten and After School Programs. Apakah perbedaan sekolah taman kanak – kanak traditional dan TK Montessori? Bagaimana metode Montessori itu ? Bagaimana anak – anak belajar di sekolah Montessori? Bagaimana guru mengajar di sekolah Montessori? Apakah anak – anak sekolah Montessori bisa beradaptasi bila melanjutkan ke sekolah negeri? Usia berapa sebaiknya anak masuk sekolah Montessori? Untuk siapa sekolah Montessori di design? Apakah sekolah Montessori berbiaya mahal? Berikut ini adalah daftar pertanyaan dasar berikut jawaban seputar Metode Montessori. Most educators and psychologists agree that the single most important period in the development of a person’s intelligence occurs between birth and age five. A child’s mind is absorbent, and his curiosity is at a peak during these early years. When properly nourished and stimulated, the child’s mind forms patterns of learning which serve him throughout his life. A Montessori school provides one of the most effective environments in which to guide a child through these critical years. How is a Montessori program different from other preschool programs? In most preschools, the children are taught educational concepts in a group by a teacher. In a Montessori program, the children work at their own pace, independently learning concepts from multi-sensory materials designed for self-correction and physical exploration. The Montessori Method of education is basically a unique approach to learning. Rather than “teaching” the child concepts, the environment is designed in such a way to expose her to materials and experiences through which she develops intellectual, as well as physical and psychological abilities. The prepared environment takes full advantage of the self-motivation and unique ability of the young child to develop her own capabilities–all with little or no adult intervention. What is the purpose of the Montessori Method? A Montessori classroom is a specially designed and equipped environment where the child can unfold spontaneously and manifest the greater person within. As Dr. Montessori said, “The child is the father of the man.” (The Secret of Childhood, Maria Montessori, p. 36, 194). The purpose of the method is the development of the child’s inner self, and from this, love of life and learning expand continuously. The Montessori classroom is a child-sized world. Whatever is in the world outside can be incorporated meaningfully into the Montessori classroom. To the young child, the world is unmanageable–it is too big, too complex, and too confusing. By careful selection of materials by the teacher, an environment is set up which allows the child a place to explore life on a level she can understand. The materials and exercises are designed to stimulate independent exploration. This prepared environment entices the child to proceed at her own pace, from simple to more complex activities. Through this process, her natural curiosity is satisfied, and she begins to experience the joy of discovering the world around her. Materials and curricula center around practical life, sensorial, mathematics, language, geography, history, science, art, music, drama, and perceptual motor development. How do children interact within the environment? As the children develop their sense of pride in their “work,”a feeling of confidence, well-being, and joy begins to manifest itself in the child. A “new child” is born. A classroom of Montessori children is a joy to watch. There seems to be a spirit of respect, love and cooperation among the children. A feeling of community pervades the classroom. Why do the children “work”? The child has a deep love and need for purposeful work. He works, however, not as an adult for profit or completion of a job, but for the sake of the activity itself. It is this activity which accomplishes for him his most important goal: the development of himself–his mental, physical and psychological powers. His play is his work, and his work is his play. In a Montessori classroom there is no front of the room and no teacher’s desk as a focal point of attention because the stimulation for learning comes from the total environment. Dr. Montessori always referred to the teacher as a “directress, or director,” and her role differs considerably from that of a traditional teacher. She is, first of all, a very keen observer of the individual interests and needs of each child, and her daily work proceeds from her observations rather than from a prepared curriculum. The Directress works with each child individually, allowing her to choose from many activities within her range of ability. The teacher stands back while a child is working, and allows her the satisfaction of her own discovery. With all of the freedom, isn’t there confusion? The concept of freedom in the classroom is a freedom within limits. A child is free to move about the classroom at will, to talk with other children, to work with any equipment whose purpose he understands, and to ask the teacher for presentations of new material, so long as he does not disturb others. Actually, children who have the freedom to follow their interests, are generally happily and busily involved in their work. When is the best time for a child to begin? Nature has given children special forms of mental powers which aid in their self-construction. The first of these powers is the “absorbent mind,” the ability to absorb all aspects of one’s culture and civilization without effort or fatigue. This mental approach is indiscriminate, incorporating both good and bad, and begins at birth. Children also experience sensitive periods in their development. During these periods, they seek certain stimuli with immense intensity, to the exclusion of others. These are transitory periods in which they develop specific mental functions, such as movement, language, order, refinement of the senses and social awareness. They occur universally at approximately the same age in all children. If a child’s need for specific stimuli is not met during the sensitive period, he loses the opportunity for optimal development. What he can learn almost effortlessly at this critical time will take effort on his part later. Dr. Montessori devised special materials to aid children in each sensitive period. Between the ages of 2 and 3, a special sense of order, concentration, coordination, and independence emerge. This time is ideal to begin a child’s training in Montessori, as she is at the perfect period to build a strong foundation for future learning. Children who have been in a Montessori environment are generally very flexible and adjust quite easily to a public school situation. They are generally better students and spend their time in more productive ways because of their self-discipline, independence and positive attitude toward learning. Socialization is very much a part of a Montessori classroom. In the classroom you will notice children interacting continuously: younger children inspired to do more advanced work by observing and learning from older ones, and older children learning through teaching and helping younger ones. Daily the classroom community comes together to sing and read stories, and lessons in grace and courtesy, an important component to building the classroom community, are often given in small or large groups. A Montessori classroom has often been described as a “natural social setting,” with children free to interact with one another. The Montessori method is an approach to learning, and as such, has no distinction of class or intelligence. It has been used successfully with children between the ages of 2 1/2 and 18, in all parts of the world, from all socioeconomic levels representing the average, gifted, retarded, emotionally disturbed and physically handicapped child. Tuition in Montessori programs throughout the country tends to be higher than in other programs because of the extensive materials, encompassing environment, balanced curriculu. It is, however, a very reasonable cost in contrast to other activities you would plan for yourself or your child. To give your child the finest possible experience in his most sensitive years is to give him a strong foundation throughout his life, and probably ward off investment, later, to correct or remedy that which was missed. Many educators believe it is a wise decision to invest in a child’s preschool education because the child who enjoys learning and becomes self-directed at the critical preschool age, will benefit through all his years of learning. The goal of the school is to help children become creative, competent individuals, who are fully aware of themselves, others, and the world around them. Additional goals include love of learning, self-motivation, persistence and concentration, habits of inner discipline and order, and increased self-esteem. To realize these goals, we have created a school where children can be themselves in an atmosphere of freedom and responsibility. 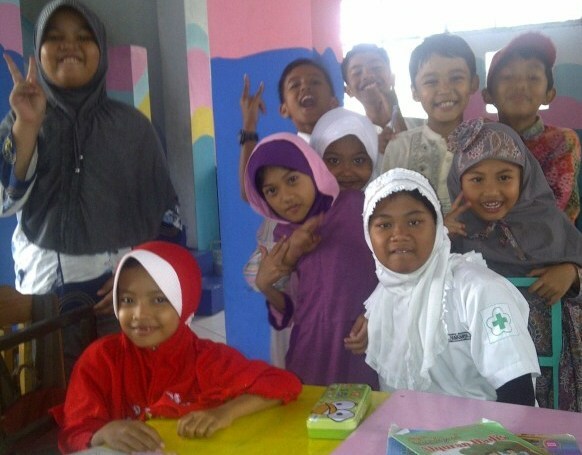 A Depok Montessori is a place where little ones will come joyfully and discover a love of learning. THE FIRST DUTY OF EDUCATION IS TO STIR UP LIFE, BUT LEAVE IT FREE TO DEVELOP.